Following a series of intense winter storms last February, a section of the main spillway at California’s Oroville Dam cracked and crumbled, opening a huge hole in the chute. Water pummeled the exposed dirt and rock below, eroding chasms in the hillside and the spillway, about 70 miles north of Sacramento. As officials struggled to keep more of the spillway from disintegrating over the next few days of rainy weather, the reservoir continued to rise. Eventually, it spilled over a second, never-before-used emergency spillway, a lip of concrete that funnels water down a bare hillside, which also began to wash away. That, officials feared, could undermine the side of the reservoir itself, which would send catastrophic floodwaters careening, uncontrolled, toward the communities below. More than 180,000 people living downstream of Oroville Dam — the tallest dam in the U.S. — were evacuated on Feb. 12. In the following days, the rainstorms eased, dam managers were able to keep water off the emergency spillway and the reservoir walls held. To avoid the risk of further erosion, however, both spillways needed to be patched up before this winter. 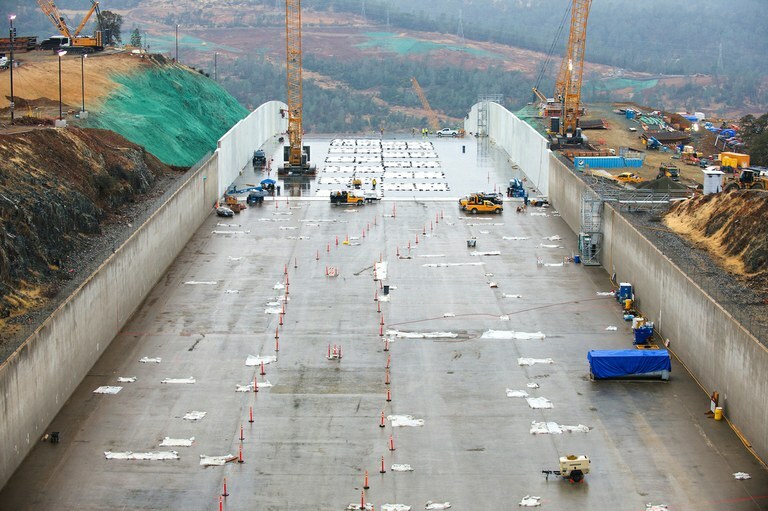 By early November, following months of ‘round-the-clock work, the California Department of Water Resources announced that Oroville was ready for the rainy season, though final repairs will take another year. And the consequences of the incident could last far longer: Its sheer scale means it has the potential to affect legislation and policy, as did earlier disasters at other dams. Safety officials in California and across the West are already reassessing spillways, updating disaster plans and refining evacuation maps, hoping to prevent a repeat of Oroville — or worse. Structural failures were the immediate cause of the Oroville catastrophe. The main spillway has successfully handled larger flows than what it saw last February. While it’s not yet clear exactly why it broke apart, some researchers say part of the blame lies in poor design and shoddy maintenance — and that those problems could have been addressed. An independent group of dam experts is investigating what went wrong, with a final report expected by the end of 2017. An interim report released in September notes that there was preexisting damage and repairs at the area that first crumbled. Weaknesses there could have allowed water to get beneath the spillway, potentially blasting apart the concrete from below. Administrative failures — problems with inspections or regulations — may share the blame for what happened at Oroville. A patchwork of agencies meant to prevent such problems regulates dam safety in the United States. Federal agencies like the Bureau of Reclamation and the Army Corps of Engineers oversee inspection and maintenance at their own dams. Dams that belong to the state, like Oroville, or a utility company or other non-federal entity, are typically under the jurisdiction of a state agency; the Federal Energy Regulatory Commission (FERC) is also involved in dam inspections at non-federal dams with hydropower projects they license, including Oroville. The first rain of the season falls on the main Lake Oroville spillway on November 3, 2017. Experts say it’s too early to judge how much dam safety policies at both state and federal levels will ultimately transform because of Oroville. Some states, however, are already reviewing structures and safety procedures in the wake of the catastrophe. California’s Division of Safety of Dams is evaluating spillways at 93 dams that are similar to Oroville. And in June, the state passed legislation requiring regular updates to emergency action plans — basically, blueprints for how to deal with disasters — for dams that could cause major destruction should they fail. Other states are also reviewing emergency plans. In Montana, officials are revamping how they create evacuation maps, says Michele Lemieux, the dam safety program manager at Montana’s Department of Natural Resources and Conservation. “(For) most of our dams, and actually most of the dams in the country, all the evacuation maps are for this catastrophic failure of the dam,” she says. Those are crucial, but it’s also important to have flood maps for a range of emergencies — including, for example, the collapse of a spillway — which might not produce as much flooding as a full dam failure. “You don’t want to get people out of the way that don’t need to be removed,” Lemieux says. In California, workers are putting the finishing touches on recent spillway repairs at the dam. The main spillway isn’t used every winter; water managers only need it when there’s too much water to be released through Oroville’s other outlets. While this winter’s rain forecasts for northern California are uncertain, the region regularly experiences wild swings in precipitation. “We needed to make sure that we had systems in place for this year,” says Erin Mellon, a spokeswoman for the California Department of Water Resources. This winter, the spillway should be able to withstand as much as the maximum flows of last February, about 100,000 cubic feet per second. (Following additional repairs next year, it should be able to handle 270,000 cubic feet per second.) Construction crews are also refurbishing the emergency spillway. Next year, officials plan to line part of the bare hillside with concrete, something environmental groups warned was necessary more than a decade ago. Between emergency repairs and long-term reconstruction, the final tab for the work at both spillways is expected to be more than $640 million, some of which will come from federal funds. Most large dams were built to withstand extreme weather, but the guidelines for water releases around storms need to catch up to reflect changing conditions. If they don’t, incidents like Oroville, and the enormous price-tags that come with them, could become more common.